We've signed a new one-year lease starting in September, so we're definitely putting some roots down in the sand. 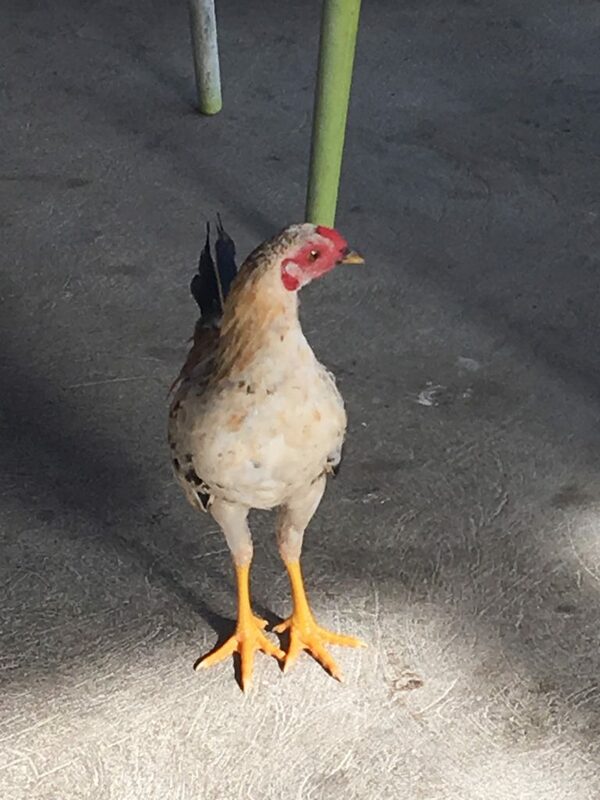 As we settle in to our new normal life on Vieques, we realize that many things we now consider normal, well they just weren't normal a few months ago. This may become even more obvious next month when we visit the States. We're going primarily for our son's wedding, but we're taking advantage of the trip for an extended vacation, to skip out on a key part of hurricane season, to see lots of old friends, and to re-acquaint ourselves with the incredible Colorado beer scene (Colorado ranks 2nd in the country in craft beer production & 3rd in breweries per capita). We'll be off the island for over 5 weeks which in comparison to others, is a short respite from island life. In the States, it is common to take a 1 or 2 week vacation, very common. In the islands, many islands anyway, it is more common to take a month, or 2 or 3. We love where we live, but it's nice to get a break once in a while. So we wonder if Colorado will feel normal to us or if it will feel strange since our lives are so different now. It takes some time, but eventually what happens "here" becomes normal, no matter where "here" is. Let's explore this. Note: the roads in the pictures are two-lane roads, in spite of what they look like, so often we must choose between a head-on collision and a pothole that affects our internal organs. The result of these skinny roads is the driver's side front signal light is destroyed (very common), and the passenger side paint is scraped from the bushes on the sides of the roads (more than half the cars maybe?). We already have the scrapes on our car, but not collision damage (yet). This was paved in my lifetime, for sure. 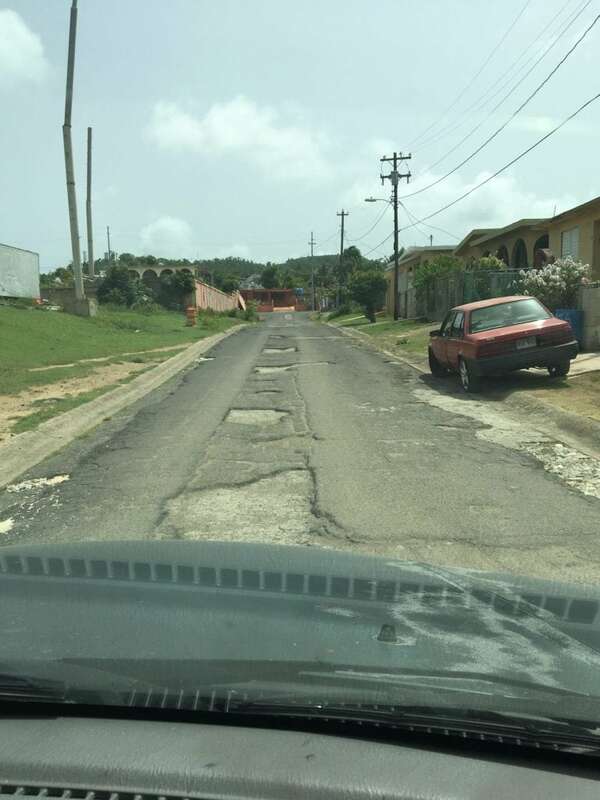 I can't tell you where every pothole is between home and town, or home and the southside beaches (our most common trips). But as I drive the roads, I have certain paths I take in a subconscious way, squeezing over to the right after this curve, squeezing to the left immediately after that, hopping into the oncoming lane and punch it up this hill before someone comes around the curve at me. I have a cadence, a flow, a zen trance, a method that involves the whole road and strategically speeding up or slowing down to find the smooth road before the next oncoming car comes around the bend. I call this game "pothole chicken" and all drivers here play it. Two cars heading right at each other, one avoiding all the potholes in his side of the road, and the other just carrying on and waiting for the first guy to get over. They always get over, and nobody really sweats it. Mack trucks always get the right of way! 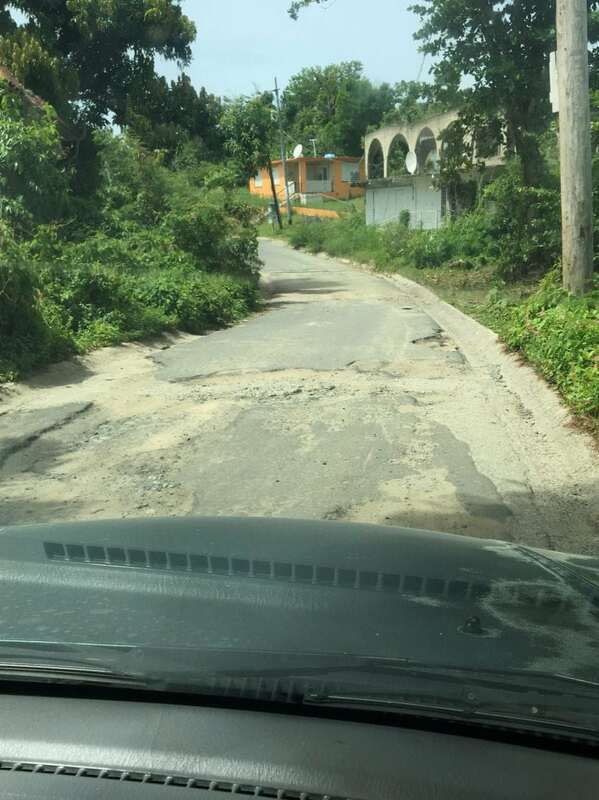 Speaking of driving, there are no traffic lights on Vieques. None. And to be honest, they're not needed. I love that we live in a place where traffic lights aren't needed, and stop signs seem to be somewhat optional. On the roads, there is a strange mix of this laid-back vibe and momentary terror. Peaceful cruising is sometimes interrupted by a drunk taking up way more than his allotment of pavement or by a young person in a hurry to go nowhere. I know he's going nowhere, because you can't get far on an island in a car! And if you are in a hurry to go somewhere, you better hope you don't get stuck behind a Viequense stopping to chat with their buddy. This is a tradition I love. You can literally stop your car, have a chat, and the people behind you will just wait. It could go on for five minutes and nobody seems to mind. Or at least they don't honk like they would in the States. 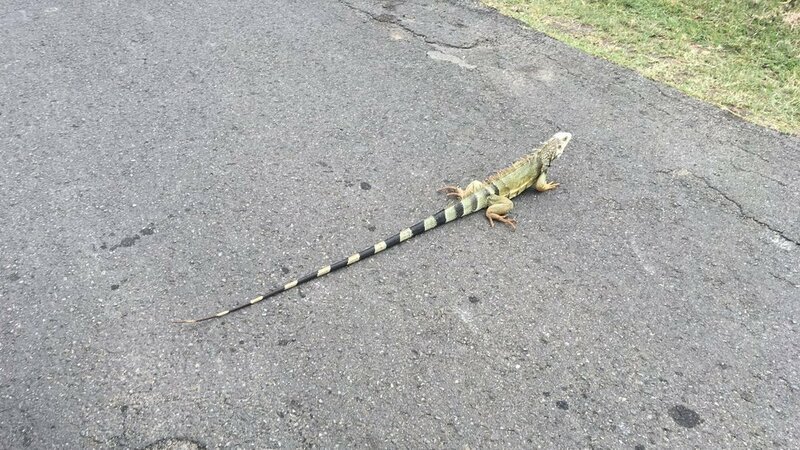 Side Question: Iguanas, Mongooses, and Chickens, why do they cross the road? I don't know, but they're risking their little lives! They probably think it's normal to do that. But anyway, the driving that's normal here isn't normal where we've lived before. Let's talk about beer. 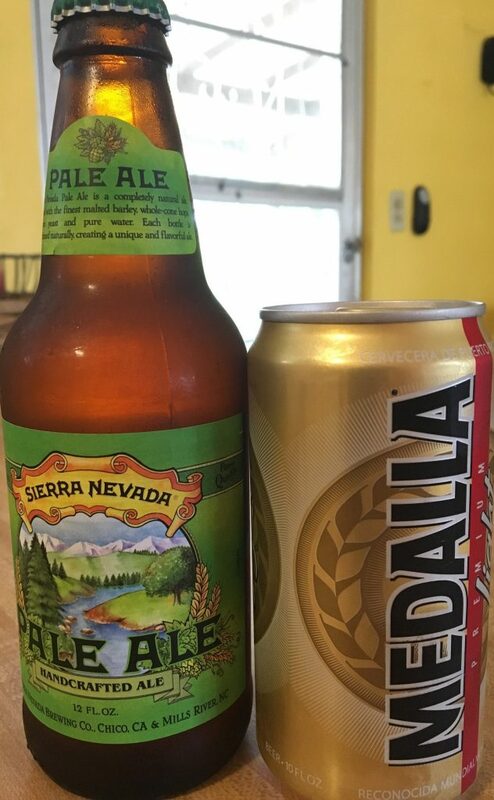 The normal domestic beer here (Medalla) comes in 10 ounce cans, as do the cans of Coors Light (but not the bottles). To maintain our sanity we've learned to not ask why (much), so I'll just jump to the answer without asking the question: because a 12 oz. beer will get warm before you finish it. Or, it could be to keep the price of a beer down. Or maybe to help keep alcoholism down, which may have credence when combined with the fact that those popular beers are only 4.2% alcohol. Never mind that you can drink 3 of them in the time it takes you to step out of the car and walk over to the beach. And there is no draft beer (almost none anyway). Again, not asking why, just jumping to the answer, which is "I don't know" (Third Base!). The one place I've found on the island that does serve draft beer uses an air compressor to push the beer, and air will make beer go stale if they don't finish the keg within a week or so. I've been told that you can't bring canisters of CO2, a non-flammable gas, over on the ferry from the mainland. Yet they literally haul tons of gasoline and diesel on the same ferries. So, I'm sticking with "I don't know" on this one. I buy some good craft beers (Lagunitas, Sierra Nevada, Sam Adams, Brooklyn Brewery, etc.) and they all come in 12 oz. bottles, but from my point of view, the beer scene is definitely not normal here. But it is perfectly normal to go to 3 different stores to find the right yogurt, or coffee, or orange juice. They sell out of your favorite brand and you look all over town, sometimes finding it elsewhere. And sometimes you don't, and end up finding a new favorite brand (but not as favorite as the other one!) out of necessity. We make our own yogurt now exactly because we couldn't consistently find the one we liked. But to make yogurt you need milk, and sometimes the store just doesn't have milk. That's island living right there in a nutshell. I can't imagine what it must be like to run a restaurant! It's normal here to speak Spanish on one side of the island and English on the other side, 4 miles away. It's not a rule, it just happens, and we think it's pretty cool. Our mailman works for the U.S. Government and he doesn't speak English, and that's A-OK. But I do like how many people are bilingual, esp. the older ones, and admit to being a little jealous of that. I haven't put in the effort that Deb has to get better with Spanish, so she's ahead of me. But I've been writing blogs. That's my excuse! It's perfectly normal for everyone's ears to perk up in the Caribbean every time we hear of any "tropical anything" come off Cape Verde, Africa (tropical storm, tropical depression, tropical wave, etc.). And that intense interest is not going away any time soon, not after last year's one-two punch of hurricanes! 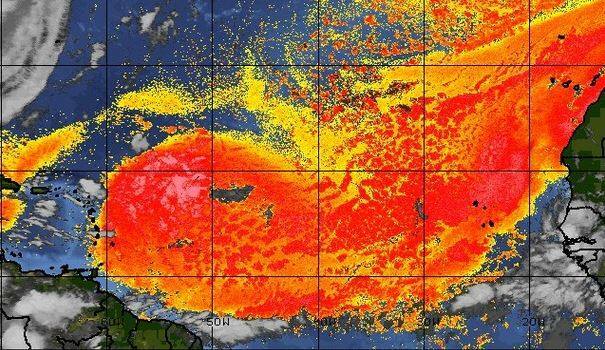 But there's one exception, which is SAL (Sahara Air Layer), which is literally dust from the Sahara Desert and the dry air that pushes it along. It serves to dry out and knock down tropical storms, so if SAL is coming off Africa we're good with that, because it doesn't make the ears perk up quite so much. It's normal also to lose power, as has been documented many times on this blog! And at the risk of jinxing all of us, I have to say we've had a couple of months of steady power. So it seems I built that solar backup system for nothing! Not really, we still love to have it - makes us sleep well knowing it's there. Steady power also means steady water, because the water here is pumped to each barrio (neighborhood). The normal here is that there are no water towers, which are very common around the world where they serve to provide a steady water pressure due to the constant elevation of the water. Water gets pumped using electricity up into the towers, but if power goes out, the water wouldn't immediately go dry because the tank is full. 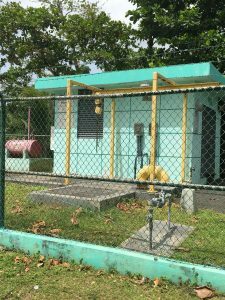 Here, what saves us is that the local pump stations have backup generators. And they work most of the time in most barrios, when they have a backup generator that is. In this respect, we've been lucky in our neighborhood called Florída (note the accent - it doesn't sound the same as my home state of Florida). The best normal thing around here is kids playing in the street all day and into the dark. I simply love this because it reminds me of my youth - it's exactly how we grew up and tried to raise our kids. But it's not too normal any more in the States, with every activity organized and regulated, adult-supervised. Kids here get to learn how to have their own fun with their own creativity, make up their own games and solve their own spats between each other. I think that's what normal should be everywhere. I guess that's a small town / small island thing, and the adult side of this is that every business is a small business. 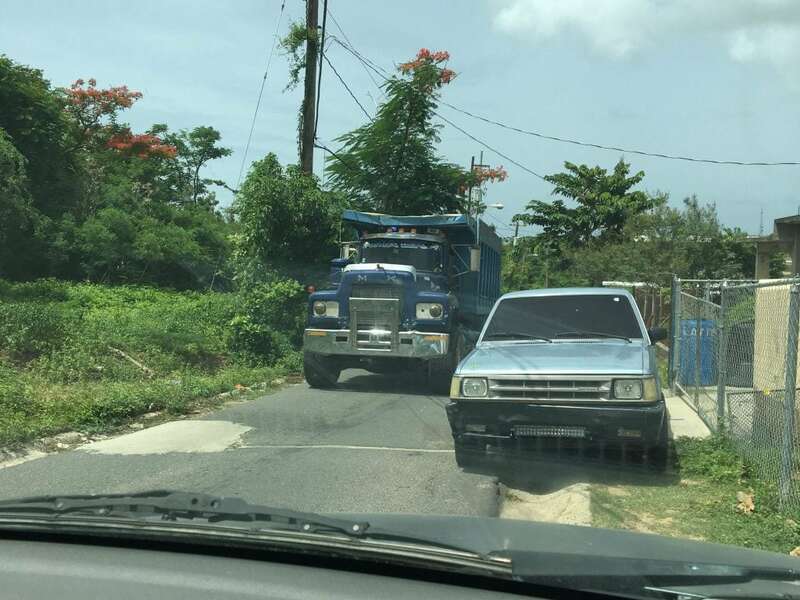 Even the General Electric plant only employs about 3 dozen people, so even the big business is a small business in Vieques. Because of that, we are slowly getting to know the business owners, whether they are restaurants, bars, guest houses, rental businesses, tour businesses, all of them. Again, normal here, but in my experience, not as common in the States unless you live in a very small town (this island has ~9000 people officially but we think it's quite a bit fewer now). So maybe that's just a small town / larger town difference. But appointments here remind me of the joke about making a reservation. You know, you make a reservation but the airline, or car rental company doesn't actually hold your reservation. (thank you Jerry Seinfeld!) It's not really cynical here regarding appointments, but it is different for sure. It turns out a dentist appointment for 11 a.m. doesn't mean you'll be seen at 11, it actually means "come in at 11 and we'll see how we're doing". And in my case, that turned into "how about you come back at 1pm?". It was actually really friendly (she didn't want me to have to sit around a wait) and the funny part is I didn't really care! I was fine with it because I knew instantly that this was island normal. And it didn't hurt that I got to watch horses eating fallen mangoes in the field out the window while sitting in the Dentist's chair! So the question remains, what is normal? And the age-old corollary: Y B Norml? Normal here is definitely not normal there, and vice-versa. We enjoy both versions of normal for different reasons. Normal life in the States is easier because of all the conveniences, and normal life here has fewer stressors if you're willing to let things go. I expect we'll be doing a blog during or after our trip to the States, on an idea I've heard about called "reverse culture shock". Maybe we haven't been gone long enough, I don't know, but we may discuss that. TODAY'S SPECIAL: "Where the Streets Have No Name" by Bono* and U2. "...when I go there, I wanna go there with you". *According to Wikipedia, he wrote this song in response to the notion that it is possible to identify a person's religion and income based on the street where they lived. On a trip to Ethiopia he imagined a place where this wasn't possible, where the streets have no name, and wrote the lyrics on an air-sickness bag on the way home. 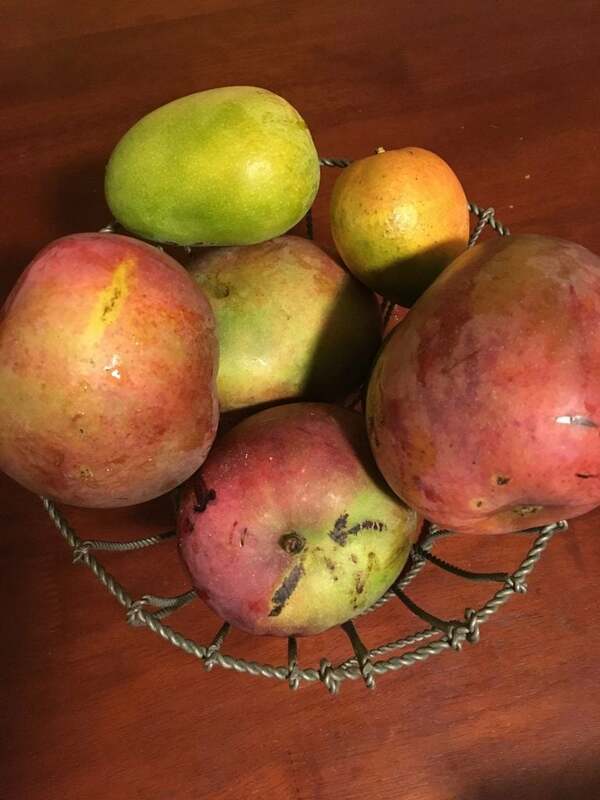 So do mango trees! I’ve been hearing about people losing windshields to them (well, to falling mangoes) the last couple of weeks. Good thing we like them, and the local horses love them. Everybody has their own normal of course, but you two fit embrace your normal better than most. You are amazing. Love you and excited about seeing you soon.